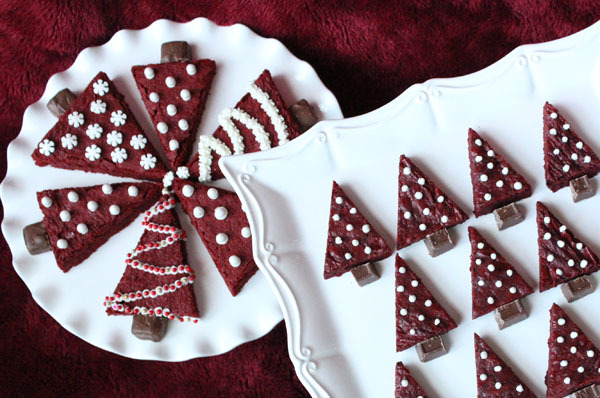 These holiday red velvet Christmas tree brownie treats comes from our new baking contributors Carrie, from Worth Pinning. Aren't they so gorgeous?! 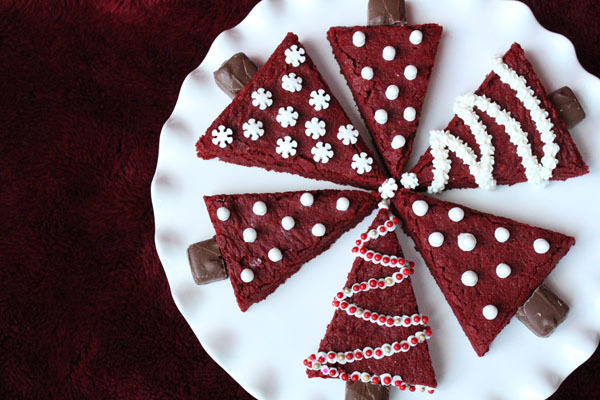 With so many special treats baked around the holidays, brownies can get left in the dark. As one of the most requested treats in my household, I thought I'd find a way to bring this otherwise dark and rather drab looking dessert into the holiday festivities this year. 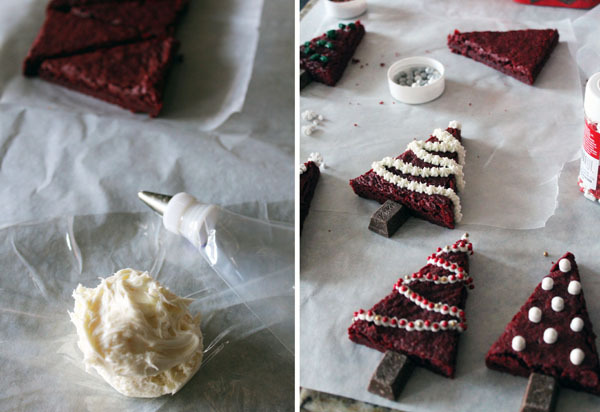 And the best part, these pretty red velvet trees don't require any fancy decorating skills. Melt the butter in a saucepan over medium heat. 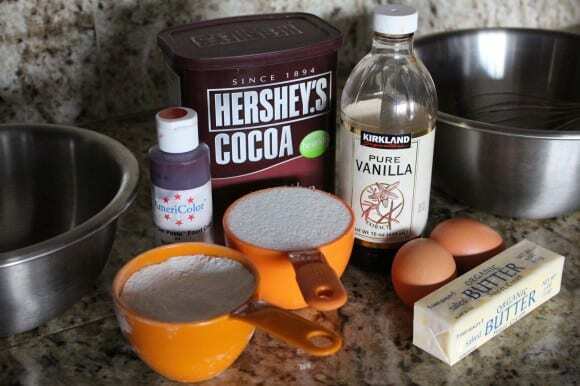 Pour in a medium mixing bowl. Whisk 3 eggs in another medium mixing bowl. 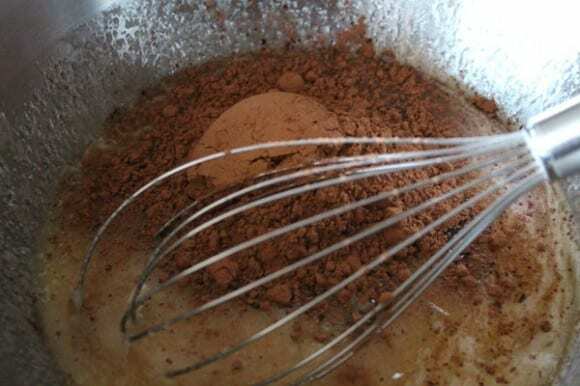 Add the sugar, vanilla extract & cocoa powder to the melted butter and combine. Melt the 1/2 cup of chocolate chips in a saucepan and add to the sugar mixture. 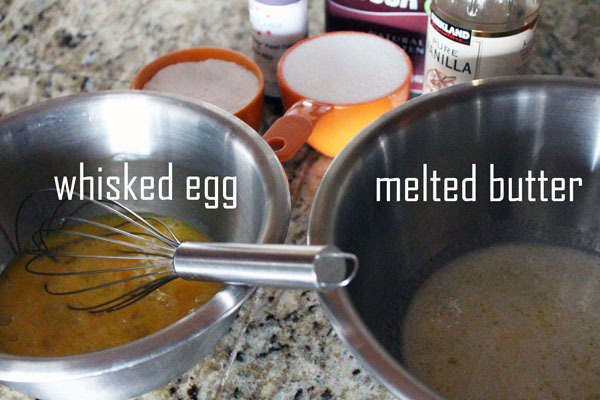 Add the whisked eggs to the sugar mixture. Add red food coloring. 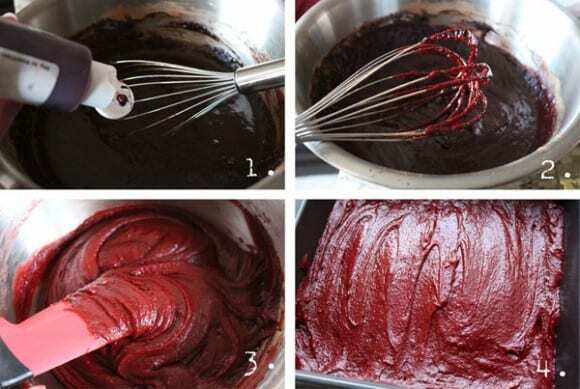 If you want a brighter red, use more red food coloring. Divide brownie batter between two 9x9" pans sprayed with cooking spray. Bake at 350F for approximately 35 minutes. You want the brownies to bake long enough so the entire brownie lifts from the pan in one piece. The edges may be a little more done than the middle. You can trim the edges. You can't un-goo the centers if they aren't baked enough. Let the brownies cool and remove from pans. For larger brownies, slice the 9x9 square in half and then cut 3 triangles from each row = 6 large trees. 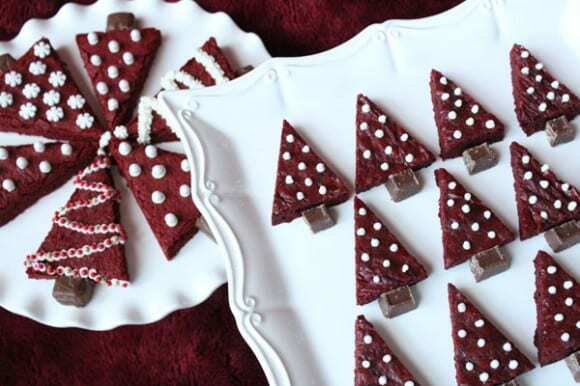 For smaller brownies, cut in 3 rows and slice into 7 triangles = 21 smaller trees. Eat the trimmed excess. I usually find kitchen helpers by then to help with that step. There are so many decorating possibilities with these trees. I prepped a bag of white frosting to add sugar pearls. I would typically put a scoop of frosting in a Ziplock bag and snip the corner, but I wanted to try a star decorating tip as well. Pipe dots and place sugar pearls or other seasonal sprinkles using a pair of tweezers. Don't have that kind of patience? Pipe a line and dunk the brownie on a plate of sprinkles. Same look, but easier for kids to help. My tip for using decorating bags is to first place the frosting on a piece of plastic wrap, roll it and secure with tape and then insert inside the decorating bag. Pull the end of the plastic wrap through the end and then add the tip and secure with the coupler. When you are finished, just pull the plastic from the bag and you can reuse the bag again. The only thing you have to clean is the tip. The tree trunks were created using a variety of mini candy bars such as mini Kit Kats, Nestle Crunch Bars, Milky Ways, etc. Hold on to some of your Halloween candy this year! 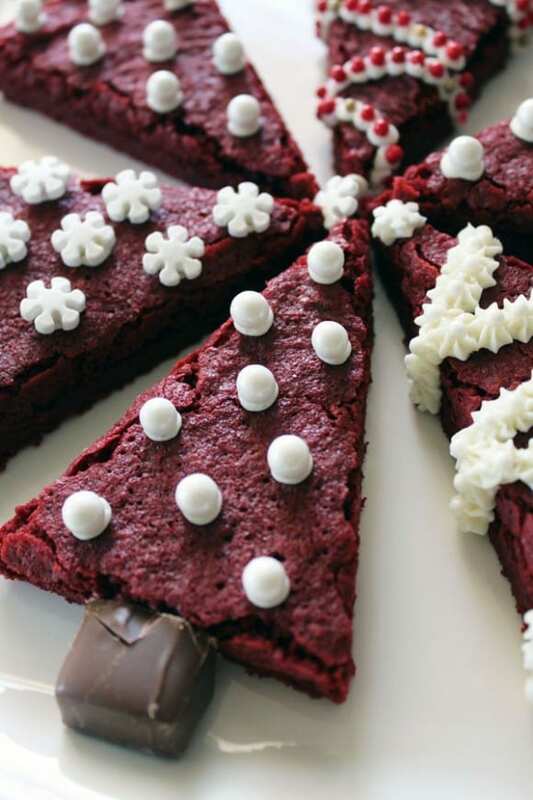 These chewy Red Velvet Brownies can be baked and decorated within an hour. Watch out- they'll be gone before you know it. Luckily, this recipe is easy enough to make again and again. Thank you Carrie for such a delicious-looking holiday treat! I could eat that whole plate! To learn more about Carrie and follow her on all her baking, crafting, DIY, and wellness adventures, check her out at Worth Pinning and on Facebook and Pinterest. 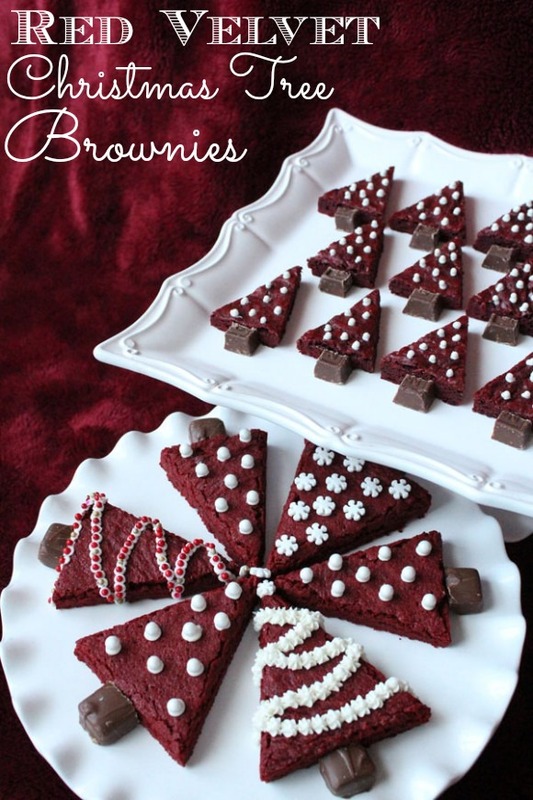 Very cute brownie trees! They look yummy also. Bake at 350F for approximately 35 minutes. You want the brownies to bake long enough so the entire brownie lifts from the pan in one piece. The edges may be a little more done than the middle. You can trim the edges. You can't un-goo the centers if they aren't baked enough. Let the brownies cool and remove from pans. For larger brownies, slice the 9x9 square in half and then cut 3 triangles from each row = 6 large trees. 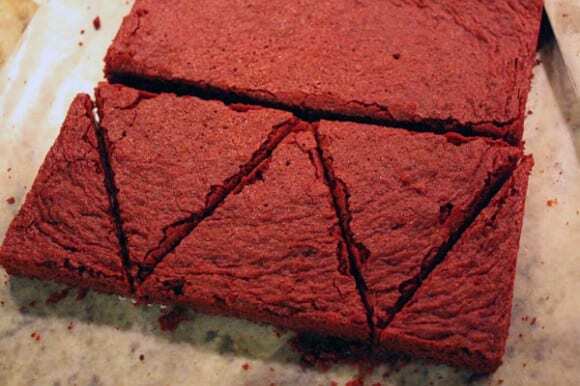 For smaller brownies, cut in 3 rows and slice into 7 triangles = 21 smaller trees. Eat the trimmed excess. I usually find kitchen helpers by then to help with that step.